Pennsylvania Appalachian Wagon Train Journey begins Fathers Day! Follow the unique Appalachian Wagon Train annual week-long journey beginning Father's Day. 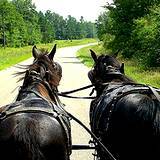 A caravan of horse-drawn wagons stop at Pennsylvania historic sites and events during the 50 to 90 mile trek each year. The number of participants vary each year from 250 to 500. All members dress in period pioneer costumes, and every wagon is covered in canvas. 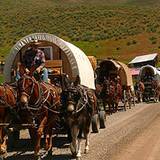 The self-sufficient wagon train travels with a chuck wagon, souvenir wagon, portable restrooms and water supply. Each year the Appalachian Wagon Train Association decides on which areas of Pennsylvania they want to honor. 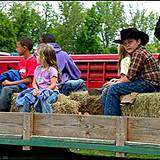 The family-oriented wagon train makes their choices by the historical backgrounds of the communities they visit. 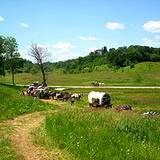 The group travels between campsites on house and in covered wagons during the day. On days when they are not switching campsites, the trek travels in loops in the surrounding areas. After moving along back roads during the day, participants spend their evenings having ice cream socials, pool parties and hillbilly jamborees, and the public is invited to stop by the campsites and learn more about the group. There are also nondenominational services on Sundays during the trek. 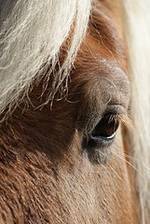 The public is always welcome to the campsite to come look at the horses and wagons, interact and talk to the people while taking a step back in time when life was simple and full of wonder of the future. The Appalachian Wagon Train Association was organized in Somerset County in 1970. The first trek, from New Baltimore to Ligonier, was in honor of Somerset County's 175th anniversary. Since then the trek has become an annual event, bringing attention to historical sites and events in the Pennsylvania Appalachian region. 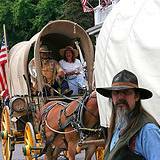 In the most recent event, 2010, a sea of covered wagons, part of the Appalachian Wagon Train Association, made a journey from Lilly, Cambria County to Janesville, Clearfield Country. This was the associations 41st trek. 2010 trek had about 30 wagons and buggies, with about 180 people from 50 families participating. One of their campsites was on a farm field campground outside of Chest Springs and made a loop to Wopsononock Overlook or known by the locals as Wopsy Lookout. 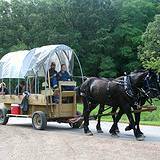 The Appalachian Wagon Train Association has a membership of about 300 families from Pennsylvania and neighboring states. The membership votes on an invitation and then appoints a trail committee to lay out the trail and find campsites and connect with the host families. The 2011 Appalachian Wagon Train will be held in Punxsutawney, PA. Home of Punxsutawney Phil and the world famous celebration Ground Hog Day . NOTICE! : Pennsylvania Mountains of Attractions is not responsible for any of the sites we post on this website. We are reporting the sites and information for entertainment purposes only. We are not legally responsible for any opinions expressed by the sites we mention. All material is as accurate as possible, but we do caution visitors to the site to contact sites that they may want to visit for further information, updates or cancellations. START YOUR HOME BUSINESS NOW AND BUILD YOUR DREAM! What's stopping you?